Pura Luhur Batukaru located in the village of Wongays Gede, Penebel District, Tabanan Regency. Located approximately 60 km north of Denpasar, right at the foot of Mount Batukaru. 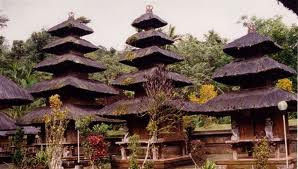 At Temple Batukaru revered Ida Sang Hyang Widi Wasa, in its manifestation as the god Mahadeva, or Panembahan Sakti Penataran Bali, which gives life to sarwa tumuwuh or any kind of vegetation. In the Papyrus Usana Bali, mentioned Pura Batukaru was built by Mpu Kuturan the 10th century AD during the reign of King Masula Masuli in Bali. At that time Mount Batukaru still named Mount Karegan. However, archaeological research shows it is far more ancient temple. The possibility of this temple there before Kuturan Mpu coming to Bali and the priest only expand and improve this temple. Piodalan or the annual ceremeny at Temple Batukaru held on Wraspati Umanis Dungulan, or once every 210 days according to the Balinese calendar. Piodalan Day coincides with Manis Galungan day or the day after Galungan. In the Babad Buleleng Lontar also contained a story relating to the Pura Batukaru. Told I Gusti Ngurah Panji Sakti with his troops walking towards the border of Tabanan. His trip to Tabanan aims to make war, but because there is no response, then dirusaklah Pura Batukaru as anglers to conduct warfare. With a complete weapon, his followers ransacked the temple, as well as moving palinggih from its original place. Suddenly from nowhere, miraculously giant wasps arriving at one fist, then invaded and overrun Panji Sakti. Since the number of these wasps, resulting in Panji Sakti ran without daring to look back.Panji Sakti of Buleleng and then go back to the empty-handed. According to belief, these giant wasps are the messengers who berstana at Temple Batukaru to punish Panji magic. Fortunately Panji Sakti because the berstana at Temple Batukaru still be generous, not to kill him, although it has been very damaging parahyangan purified.